A modular socket mounted at the front of the seat allows quick disconnection from the midline drive position for safe easy transfers in and out of the chair. The front socket can also be mounted with an optional flip-down or removable bracket, depending on the needs of the client and their method of transfer. The single arrest mounted ErgoRejoy joystick positioning and assessment system can be mounted in a socket on either armrest. This socket location is preferred by some end users that find a front control socket uncomfortable, or would like wear a dress while seated. The dual armrest mounted MicroTray and Eclipse trays provide modular drive controls for power wheelchairs with standing and reclining seat back options. Because these trays are mounted to the armrests they move in conjunction with the seat back in order to retain position of operation by the end user. A modular socket mounted behind the headrest allows a head array or swing-away chin control to be mounted in the rear position. 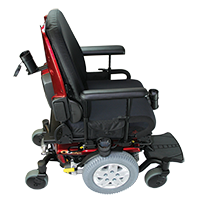 A modular socket mounted behind the seat allows the carer/spouse to seamlessly transfer the drive control from the primary drive position to an attendant position. The controls most suited for attendant/caregiver use are the ReJoy 360 and the ErgoReJoy (configured for armrest operation), as well as the JoyBar. It is recommended that the socket be located so the drive control position results in the hand(s) height in line with the core of the attendant. The Central Drive System allows secure placement of a drive control nearly anywhere on a power wheelchair with our modular mast and socket system. Demo Request Back to Main Quote Catalog F.A.Q. The Central Drive System is a modular mounting system for drive controls and accessories. It can help improve postural positioning for power wheelchair patients. It also enlarges the overall patient population that can benefit from power mobility. The most utilized components of the Central Drive System are the JoyBar drive control and the ReJoy platform. These components convert a standard powerchair to midline drive. The JoyBar allows a patient to drive a power wheelchair with scooter-style digital steering, and the ReJoy re-positions a power wheelchair’s existing joystick drive control at midline. The Central Drive System can also be utilized with the many specialty rehab drive controls found in the Active Controls Rehab Solutions product line. The advanced control technologies in this product line are enhanced by the modular, robust mounting provided by the Central Drive System.